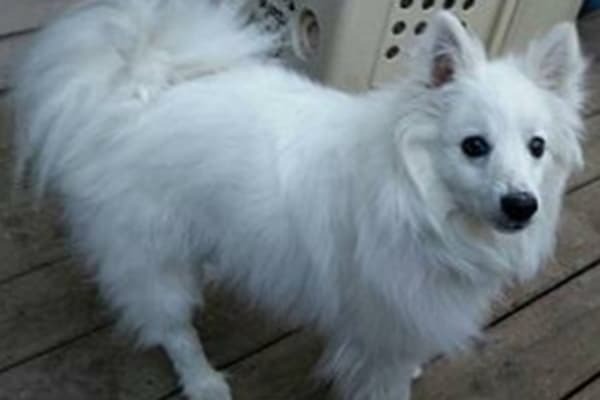 Koda is a 1 year old American Eskimo that came to New Hope Dog Rescue April 2015 because of medical issues (a few seizures). Koda has had some preliminary blood work done and it was found that one of the liver enzymes was increased. An ultrasound of the liver did not show any abnormalities. More tests are required to help determine the cause of the seizures. Koda is learning a lot of new things while he is with us to help improve his confidence! Update (June 24, 2015): Koda had his 1st seizure in his foster home, it only lasted 15-20 seconds but Koda was disoriented for a while after it happened. Poor boy! Thankfully all the tests have come back normally but unfortunately this likely means that Koda has epilepsy of unknown origin. He will require anti-seizure medication for the rest of his life. He’s such a trooper! Update (November 6, 2015): Koda’s bile acids were rechecked and the post bile acid results were high again. This means he is not clearing bile as he should. Having found no shunt, this makes things more difficult. We are trying liver supplements for 90 days and then will re-evaluate his response. We are hopeful that we will be able to help this sweet boy live a happy and healthy life! Update (March 23, 2016): After trying a number of things we finally seemed to find the treatment regime that would work for Koda!! Update (June 2, 2016): Koda is adopted by a wonderful family in Ontario! 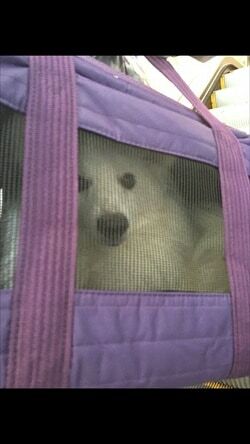 They flew out and took Koda home with them!! What a lucky boy! If you would like us to continue to help dogs like Koda please consider making a donation to our Guardians of Hope fund!